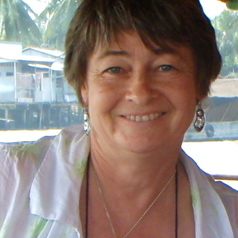 Maria Byrne is Professor of Marine and Developmental Biology at the University of Sydney. For 12 years she was the director of One Tree Island Research Station, the University’s facility on the Great Barrier Reef. Over the years this iconic, fully protected reef system has provided a major platform for Prof Byrne’s research on the biology and ecology of marine invertebrates that has largely involved echinoderms as model organisms. Her work on comparative evolutionary developmental biology and marine climate change has been funded by the Australian Research Council and other agencies for over 20 years. In recent years Prof Byrne’s work has involved the quantification of the impacts of climate change stressors, ocean warming and ocean acidification on fundamental biological processes including growth, physiology, development and calcification. This work investigates the responses of marine invertebrates across life stages to climate change and has involved species from the tropics to the poles. Most importantly the labile nature of development and possibility of an in-built redundancy and adaptive capacity of developmental processes in a climate change world will be crucial to the resilience of some marine species. Her current research investigates potential for climate adaptation merging here two main areas of research, evo-devo and global change.